Camping Miramare est un camping qui se trouve à Sottomarina, Venise, et situé près de la mer.Ce camping propose des emplacements délimités, ombragés, non ombragés et emplacements relativement ombragés. Camping Miramare se trouve à proximité une plage de sable fin. Il est possible de louer des caravanes et des mobilhomes. Le camping dispose d'un terrain de jeu et d'un terrain de sport. Le camping dispose une piscine extérieure et d'un bassin pour enfants. A proximité immédiate vous pourrez nagez dans la mer. A Camping Miramare vous pourrez faire de la planche à voile. "Camping familial agréable et sanitaires bien entretenus, des deux côtés de la rue, à la plage." N'a pas aimé - The camping is cut in two by a road. Its quite big, with little kids its too much walk, if you get a place at the other end. A aimé - Excellent location right next to the beach. Campsite had a typically Italian vibe and was relaxed and friendly with a good atmosphere. The staff were helpful and friendly. N'a pas aimé - Staff in bar and restaurant were not very welcoming. A aimé - Nice Italian camping with big pitches layd in the son or shadow. We stood in the shadow nearby the sea, 300 meters walking.from the sea. The beach was nice and the sea isn't deep. There were most Italuan people and some 10% Dutch people. At 23 hours it was quiet at the camping. From this camping you can easily go to Venezië. We went to Fusina and took the boat there to Venetië. We also go to Choggio, nice little town, little Venetie. And went to Miramare, the city of Ferrari with the fabric, museum and you can ride in a Ferrari. The camping people are very friendly and willing to help. N'a pas aimé - There isn't much to do in the surroundings. But the beach, nearby Venetië, Chioggia makes it still good. N'a pas aimé - Nej, det var skønt. N'a pas aimé - Wi fi connection not included in the price for accomodation. A aimé - We loved the beach and a restaurant so much. Our accomodation is excellent too! Lovely people! N'a pas aimé - The little shop of the campsite. I think it need some generation. A aimé - Very helpful people in the reception, very smart you can have your own sun bed by the beach. N'a pas aimé - Not any sun beds or umbrellas by the pool and the music was very loud also when there was no intertainment. You had to shower before you got into the pool, but there was no soap to wash your hands in the toilet. There was a big fence around the pool so you(we) didn’t sit and had a coffee or ice cream while the kids where in the pool, the area didn’t invite for you to use the cafe as there were no chairs and tables outside. We think The cafe could make more money if they removed the fence and put up chairs and tables, so you can sit there, in the shadow and have an ice cream..
A aimé - the staff could not have been anymore acommodating and the site is immaculate! Est-ce que vous souhaitez réserver le camping Camping Miramare ou obtenir plus d'informations? Dans ce dernier cas, consultez les explications ci-dessous ou visitez le site Web du camping. Clairement indiqué sur la SS309, Ravenna-Venezia. À Sottomarina à droite avant la plage, puis suivre le chemin. 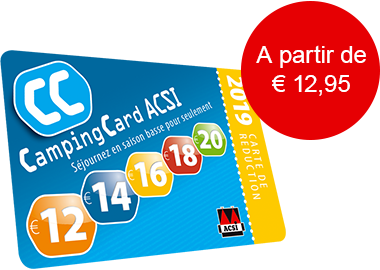 ACSI Eurocampings transmet votre demande d'informations au "Camping Miramare".